On a cool spring eve, March 15th, 2009, a bat, crippled and wistful, clung to the Space Shuttle Discovery as it was thrust toward the great beyond. Goodbye and godspeed, my magnificent Spacebat. 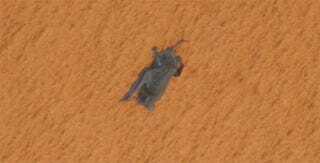 At some point during the countdown, Spacebat—a Free-Tailed Chiroptera—was spotted latched to the foam of the external fuel tank, occasionally moving but never letting go. Wildlife experts deduced that he had injured his wing and shoulder, leaving him with little chance of survival. He remained on the tank until launch. NASA's cold report? The animal likely perished quickly during Discovery's climb into orbit. Bereft of his ability to fly and with nowhere to go, a courageous bat climbed aboard our Discovery with stars in his weak little eyes. The launch commenced, and Spacebat trembled as his frail mammalian body was gently pushed skyward. For the last time, he felt the primal joy of flight; for the first, the indescribable feeling of ascending toward his dream—a place far away from piercing screeches and crowded caves, stretching forever into fathomless blackness. Whether he was consumed in the exhaust flames or frozen solid in the stratosphere is of no concern. We know that Spacebat died, but his dream will live on in all of us.